“Stuck Elevator” may not be the best theatrical offering of this season but it’s sure the best thing I’ve seen in a long while. Somewhere between a hip-hop opera and a Broadway musical, it tells the tale (based on fact) of an illegal Chinese immigrant fast-food delivery man who is confined in a stalled elevator for 81 hours without food or water, with only his fears and fantasies to keep him company. Funny, clever and deeply moving, the show condenses the immigrant experience into 90 minutes of well-delivered music and image and it’s terrific. Guang (Julius Ahn) fears to push the button to call the police because of his undocumented status. He can’t risk deportation because of all the money he owes “Snakehead” (Raymond J. Lee), the crook who got him to New York (smuggled in a container) in the first place. If he doesn’t pay back the exorbitant fee, there will be retaliation on his wife, child and parents back home. Guang is not just a “takeout man,” however. He’s a poet and his imaginary letters to his wife, Ming (the lovely Marie-France Arcilla), are a touchstone of the drama and source of some of the best songs. Composer Byron Au Yong veers from lyricism to rap at the beat of a baton (ably wielded by Dolores Duran-Cefalu over a three-piece backstage ensemble that sounds like a full orchestra at times). 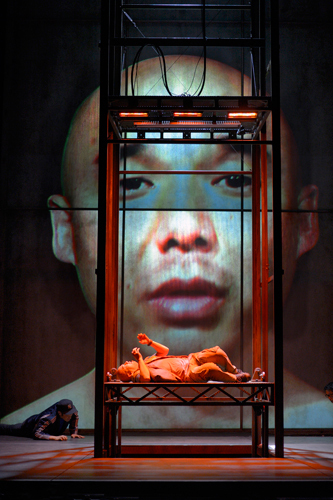 Librettist Aaron Jafferis’ lyrics and dialogue are inventive, vernacular, to the point and, in an inspired touch, translated into Chinese on an overhead supertitles screen. Appropriately so, as Guang doesn’t really have enough English at his command to explain his situation, even if someone came to help him. So he is thrown onto his own resources, which turn out to be prodigious. He remembers the suffocating ship container and holding his dying nephew in his arms. He recalls – or imagines – being mugged and losing some of his already-slim savings. He imagines the anger of his boss’ wife (played with evil vigor by Joseph Anthony Foronda in drag) and commiserates with his fellow-delivery boy Marco (a very funny Joel Perez) on the difficulties of life in the New World where the streets are more often paved with peril than gold. As he grows weaker and hungrier, his fantasies turn into delirium. He dreams he is making a killing in Atlantic City (complete with showgirls and glitz). Then he is a wrestler and his opponent is Otis, the Elevator Monster, clad in steel (guess who wins). He imagines his brother-in-law (Foronda again), rich and safe in Hong Kong after deserting his wife and child, and he begins to consider doing the same and opening “Big Guang’s Long Island Chinese Buffet.” But his wife and child and creditors, armed with chopsticks, take revenge and Guang becomes the meal. All of this is enacted onstage, aided by Kate Freer’s imaginative projections and Alexander V. Nichols’ lighting. It’s hard to believe that only four actors play all the parts, from children to muggers to monsters to the guy from Homeland Security (there is even a character known as The Bladder, testifying to some of the other concerns of being confined in a small space), but, with the aid of Myung Hee Cho’s costumes and their own impressive talents, they do. Only Ahn, as Guang, does not double in roles. And it works. Ably directed by Chay Yew, “Stuck Elevator” does not get stuck in one boring moment. It moves from floor to floor, scene to scene, song to terrific song with an ease that is belied by the title. This is a world premiere, and one always wonders where such a show will go from here. In my opinion the only direction is up – perhaps right through the roof.